This hardwood tree is native to Brazil and its rainforests. 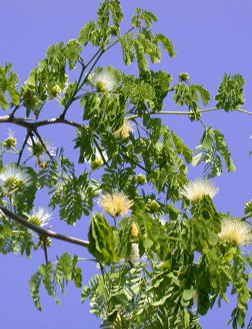 The rain tree has delicate branches and tiny light-green compound leaves and is spiny. The leaves fold up at night or in subdued light and wake up when we do. Flowers appear as fragrant fuzzy puffballs. Easy indoor care.